I don’t normally have a big sweet tooth, but lately I’ve been craving sweets like mad. Maybe it’s all the Easter chocolates everywhere I look. So this week’s French Friday’s with Dorie recipe, Visitandine, was timely. Though, my first reaction was closer to, visity-what-now? Never heard of this one before. So, from what I can tell, Visitandine is usually sold as something closer to a tea cake, like a Financier. Yum, remember Financiers? I may need to make those again soon. But Dorie has us baking this Visitandine as a cake, which can then be cut into wedges and then topped with, oh, whatever strikes your fancy. Kind of like the Sable Breton Galette. Ooh, now THAT was a delicious dessert. I should make that again. Unlike both of those cakes, this one had a very weird batter. Without Dorie’s precise instructions I would have probably given it up for lost halfway through when it started to clump up on me. But as promised, it turned out well in the end. Heck, it turned out more than “well”, it was delicious. As recommended by the gorgeous picture in Dorie’s book, I topped mine with strawberries and cream. Luckily the local strawberries are starting to hit the market (albeit at staggering prices!). Yummy. Bet it would also be tasty baked in little tea cake form, kind of like the Coconut Friands. Weren’t those delicious? This entry was posted in french fridays with dorie and tagged Around my French Table, breakfast, cake, dessert, seasonal - summer. Bookmark the permalink. I too thought about the Sable Breton Galette while making the Visitandine. That was one gorgeous dessert. but wasn’t this a lot easier to make. This one was a winner for sure, glad you enjoyed it! Your cake looks perfectly lovely! I was just thinking of making the Coconut Friands and the Financiers for my niece’s Bridal shower. They are so elegant baked in those individual molds. Glad you satisfied your sweet tooth, Rose…enjoy your weekend! This is an easy peachy recipe to whip up to cure a sweet craving! Yours look decadent with those fresh berries and cream! I’m finally catching up on the sable breton this weekend – in both galette and cookie forms. 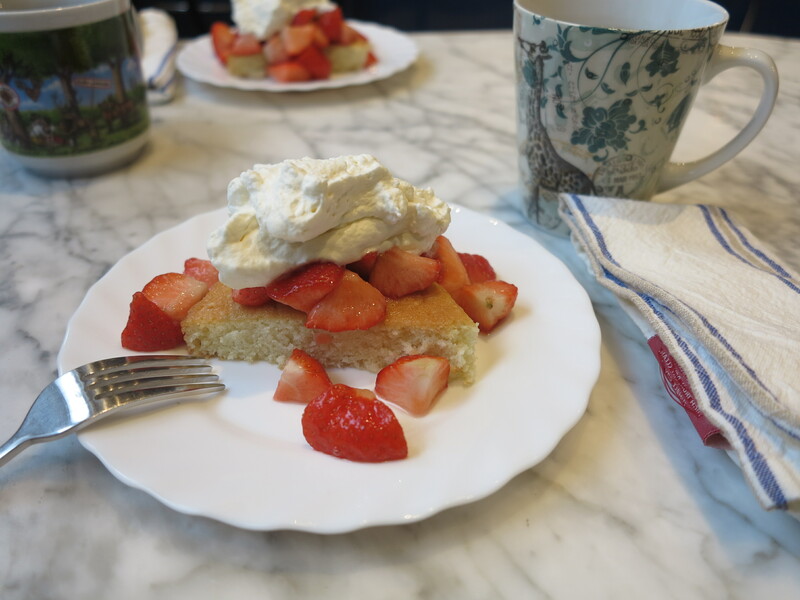 This was a great treat, too, and I can hardly wait to make it again in strawberry season! Yours looks perfect. Yes, this was one weird batter. I agree with you – I much preferred this to an overly sweet dessert. I have made the Sable Breton Galette a bunch of times. Better than this cake for bringing to friends because it’s firm and you can decorate it in advance, but I loved the lightness of the Visitandine. Rose, lovely presentation with the whipped cream and the strawberries – i have not seen any local strawberries around here though but local rhubarb which was quite delicious with this nice cake. I really enjoyed the easy unfussy nature of this. I felt silly trying to make more of it that it wanted to be. It forgave me though. Your cake looks lovely! I thought this was wonderful too. Quite easy and quick for such a nice result – and light! Now I’m going to have to go back and make the Sable Breton Galette – I never got to it. Hmmm…. This is a keeper, isn’t it? So easy and easy to make it fancy! This has to be one of the best effort/enjoyment ratio recipes in the book. And ditto for the clear instructions helping out. Yes, the batter was odd, but the end result was marvellous. I am looking forward to some Easter goodies! What a fun walk down memory lane. I think Coconut Friands were my favorite among those desserts, although the Sable Breton Galette was excellent also, and really you can’t go wrong with any of them…I always seem to be craving dessert!